Celebrate the cultural diversity of the Lower East Side/Chinatown! 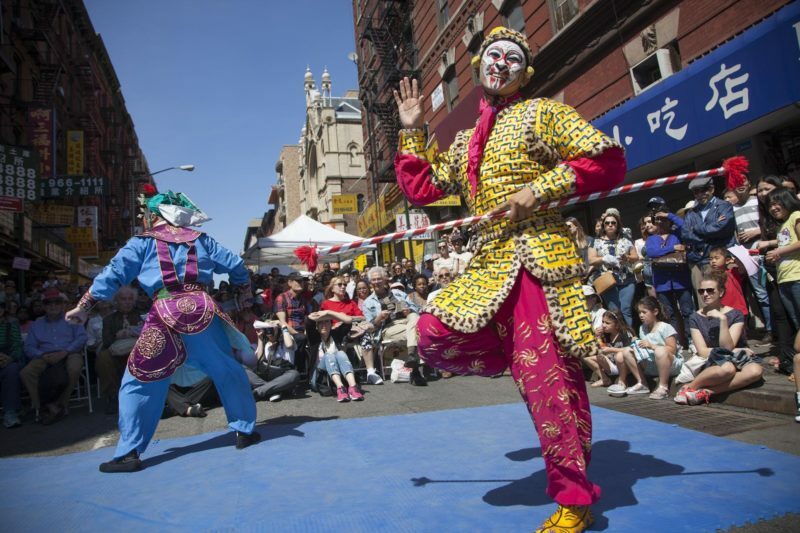 Based out of the landmark Eldridge Street Synagogue, this neighborhood festival spills out onto the street with a multitude of Jewish, Chinese and Puerto Rican tastes, traditions, sights, and sounds. A sense of place is at the heart of Egg Rolls, Egg Creams, and Empanadas. Over many decades, the neighborhood has been home to myriad communities and cultures, creating new names – Lower East Side, Loisaida, Kleindeutschland, Chinatown – and identities. These communities balance the past, present and future as they navigate the rapidly changing landscape of the city. We embrace the legacy of these Chinese, Jewish, and Puerto Rican cultures and the way they define and redefine this neighborhood. Through folk arts, which have their basis in community, folk groups reflect and communicate their values, ideas, and beliefs across generations. Music, dance, crafts, ritual practices, foodways, and other traditional art forms may be part of worship, work, or play. They are a part of lifecycle events, holiday celebrations, religious observances, and everyday life. Folk arts are passed down from parent to child, elder to younger, or master to apprentice. In the process, the arts are often adapted to accommodate changing situations. But their roots in tradition are ever present. 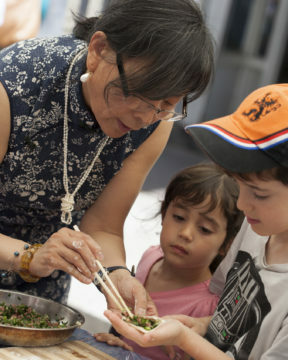 At the Egg Rolls, Egg Creams and Empanadas festival, generations will join together to present arts that have stood the test of time, but have never become static. Indeed, traditional arts themselves are a result of the constant continuation and renewal. So join with us today as young and old, father and son, grandmother and granddaughter, master and apprentice, celebrate and share the traditions and arts that bind them together. For this year’s iteration of Egg Rolls, Egg Creams, and Empanadas, we are delving deeply into music as a process. How is music made? How is it performed? What is the material culture of making music? Through community partners, we’ve brought together a great roster of artists who speak to the various facets of creating, presenting, and enjoying folk music. Skilled instrument-makers will demonstrate how to build a bomba drum and panderetas. Chinese folk musicians will lead hands-on lessons in playing traditional Chinese instruments. We’ll learn Yiddish songs and dances, move to the rhythms of Plena and Bomba music, and apply face paint for a Chinese opera performance. Please join us as we explore the world of music! 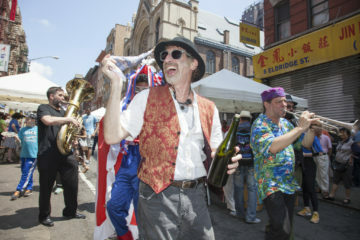 Between 1880 and 1924, Jewish immigrants from Eastern Europe made up the predominant culture of the Lower East Side in the late-19th and early-20th centuries. Between 1880 and 1924, 2.5 million mostly-impoverished Ashkenazi Jews came to the US and nearly 75 percent became residents of the Lower East Side. Many of these immigrants spoke Yiddish, a dialect developed in the 9th century by Central and Eastern European Jews with a heavily German-based vernacular with elements of Hebrew, Aramaic, Slavic, and Romance languages written in the Hebrew alphabet. Many established synagogues, small shops, pushcarts, social clubs and financial-aid societies. By 1910, with the Lower East Side’s population was well over five million, many people lived in cramped tenement buildings and worked in overcrowded factories. By the 1920s, many Jewish residents began moving to new areas of the city and country. Yet, through the egg creams, pastrami sandwiches, historic synagogues, Yiddish music and stories that thrive here, the Lower East Side continues to hold meaning as a part of American Jewish identity. Connecting with their cultural heritage, the Jewish community reflects on their history in New York, Europe, and beyond as they continue to maintain and adapt the customs and traditions of their ancestors. In fact, the Jewish population is once again increasing, as young Orthodox families move into the area, attracted by a strong infrastructure of religious, educational, and cultural institutions. Egg Creams are a classic soda fountain drink popular among Jewish immigrants in the Lower East Side in the first half of the 20th century. Strangely enough, this beverage has neither eggs nor cream, but instead contains milk, syrup, and seltzer water. Made popular at a time when high-end neighborhoods were serving cream sodas (syrup, seltzer, and cream) and ice cream sodas (syrup, seltzer, and ice cream), egg creams were a more economical version for customers on a tighter budget. The name was a genius marketing ploy as upscale soda fountains were also selling a drink called “creamed egg” meant to replace lunch with a blend of eggs, cream, syrup, and seltzer at a premium price. Customers who purchased egg creams in the Lower East Side knew the name was a misnomer but did not mind paying a lower price for a premium-sounding product. As time wore on and Jewish immigrants became more socially mobile, many moved out of the Lower East Side and carried the tradition with them. Egg Creams are often seen as something nostalgic, reminding New York Jews of simpler times. Egg Cream-drinkers argue about the proper methods of mixing an egg cream and what syrups can be used. Egg Creams can still be found at soda fountains in Lower Manhattan and across the boroughs made with classic chocolate or vanilla syrup or new twists, such as papaya.